Ahhhh, the holidays. Lit fireplaces, trees and houses glowing with lights and candles burning all signal the most magical time of year. And while our festive decorations capture the spirit of the season, they also pose a real hazard to you and your loved ones: fire. Take time this year to follow a few simple steps that will make sure you have a happy and fire-safe holiday. Choose decorations that are flame resistant or fire retardant. Some lights are only for indoor OR outdoor use, but not both. Choose wisely! Replace any string of lights with worn or broken cords or loose bulb connections – and don’t forget to read the manufacturer’s instructions for the number of light strands safe to connect! 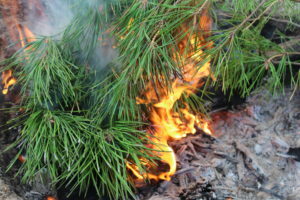 Water your fresh trees daily to avoid them drying out and becoming a larger fire risk. Keep your matches and lighters high up in a locked cabinet or cupboard. Stay in the kitchen if you’re cooking on the stovetop. Ask smokers to smoke outside – and remind them to keep their smoking paraphernalia with them so kids don’t touch them. Provide large, deep ashtrays for smokers, and wet cigarette butts before disposing. Turn off all string lights and decorations, too! These safety tips should make it easy for you to have a safe and happy holiday season. Do you have any decorating safety tips of your own? Share them in the comments below!